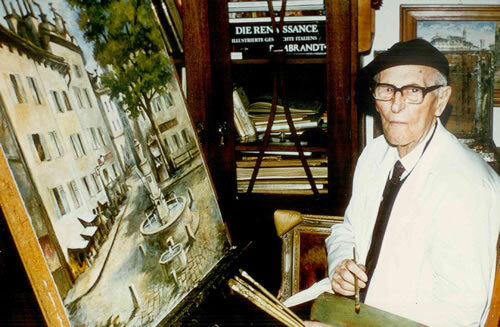 April's update also brings you something very special, it is a photograph of Mr Jean Jaques Gretaux at work on one of his wonderful paintings. These paintings often formed the basis for a Buchschmid and Gretaux wood inlay picture. Our April 2012 update once again brings you just the one item, but this one is also very special, as is mentioned in our introduction. The photo seen on the right once again comes courtesy of Mici Veit. You see in this photo Mr Gretaux of the famous Buchschmid & Gretaux Wood Inlay Company working on an oil painting of what looks like a Parisian street Cafe scene. Whether this painting was used as the basis for a B & G wood inlay work, I'm afraid we have no record for that - although we rather think it is probably just a very pleasing painting in its own right, intended solely for display as a painting in the usual style or manner. Click the above button to return to page 37 of "Can You Help"